CAUTION: Remove battery terminal and AV control unit after a lapse of 30 seconds or more after turning the ignition switch OFF. NOTE: After the ignition switch is turned OFF, the AV control unit continues operating for approximately 30 seconds. Therefore, data corruption may occur if battery voltage is cut off within 30 seconds. Do not operate the engine for an extended period of time without proper exhaust ventilation. Before jacking up the vehicle, apply wheel chocks or other tire blocks to the wheels to prevent the vehicle from moving. After jacking up the vehicle, support the vehicle weight with safety stands at the points designated for proper lifting before working on the vehicle. When removing a heavy component such as the engine or transaxle/ transmission, be careful not to lose your balance and drop them. Also, do not allow them to strike adjacent parts, especially the brake tubes and master cylinder. Before starting repairs which do not require battery power: Turn off ignition switch. If the battery terminals are disconnected, recorded memory of radio and each control unit is erased. To prevent serious burns: Avoid contact with hot metal parts. Dispose of drained oil or the solvent used for cleaning parts in an appropriate manner. Clean all disassembled parts in the designated liquid or solvent prior to inspection or assembly. Replace oil seals, gaskets, packings, O-rings, locking washers, cotter pins, self-locking nuts, etc. with new ones. Replace inner and outer races of tapered roller bearings and needle bearings as a set. Arrange the disassembled parts in accordance with their assembled locations and sequence. Do not touch the terminals of electrical components which use microcomputers (such as ECM). Static electricity may damage internal electronic components. After disconnecting vacuum or air hoses, attach a tag to indicate the proper connection. Use only the fluids and lubricants specified in this manual. Use approved bonding agent, sealants or their equivalents when required. 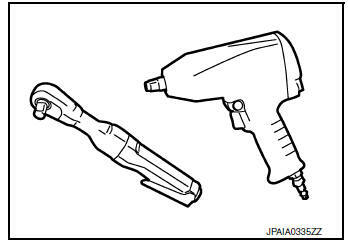 Use hand tools, power tools (disassembly only) and recommended special tools where specified for safe and efficient service repairs. Before servicing the vehicle: Protect fenders, upholstery and carpeting with appropriate covers. To prevent ECM from storing the diagnostic trouble codes, do not carelessly disconnect the harness connectors which are related to the engine control system and TCM (transmission control module) system. The connectors should be disconnected only when working according to the WORK FLOW of TROUBLE DIAGNOSES in EC and TM sections. Use unleaded gasoline only. Leaded gasoline will seriously damage the three way catalyst. When checking for ignition spark or measuring engine compression, make tests quickly and only when necessary. Do not run engine when the fuel tank level is low, otherwise the engine may misfire, causing damage to the catalyst. CAUTION: Do not use leaded gasoline. Using leaded gasoline will damage the three way catalyst. Do not use E-85 fuel (85% fuel ethanol, 15% unleaded gasoline) unless the vehicle is specifically designed for E-85 fuel (i.e. Flexible Fuel Vehicle - FFV models). Using a fuel other than that specified could adversely affect the emission control devices and systems, and could also affect the warranty coverage validity. Before connecting or disconnecting any harness connector for the multiport fuel injection system or ECM: Turn ignition switch to “OFF” position. Otherwise, there may be damage to ECM. Before disconnecting pressurized fuel line from fuel pump to injectors, be sure to release fuel pressure. Be careful not to jar components such as ECM and mass air flow sensor. If old rubber hose is re-used, install hose clamp in its original position (at the indentation where the old clamp was). If there is a trace of tube bulging left on the old rubber hose, align rubber hose at that position. Discard old clamps; replace with new ones. Prolonged and repeated contact with used engine oil may cause skin cancer. Try to avoid direct skin contact with used oil. If skin contact is made, wash thoroughly with soap or hand cleaner as soon as possible. Avoid prolonged and repeated contact with oils, particularly used engine oils. Wear protective clothing, including impervious gloves where practicable. Avoid contaminating clothes, particularly underpants, with oil. Heavily soiled clothing and oil-impregnated footwear should not be worn. Overalls must be cleaned regularly. First aid treatment should be obtained immediately for open cuts and wounds. Use barrier creams, applying them before each work period, to help the removal of oil from the skin. Wash with soap and water to ensure all oil is removed (skin cleansers and nail brushes will help). Preparations containing lanolin replace the natural skin oils which have been removed. Do not use gasoline, kerosene, diesel fuel, gas oil, thinners or solvents for cleaning skin. If skin disorders develop, obtain medical advice without delay. Where practical, degrease components prior to handling. Where there is a risk of eye contact, eye protection should be worn, for example, chemical goggles or face shields; in addition an eye wash facility should be provided. ENVIRONMENTAL PROTECTION PRECAUTIONS Dispose of used oil and used oil filters through authorized waste disposal contractors to licensed waste disposal sites, or to the waste oil reclamation trade. If in doubt, contact the local authority for advice on disposal facilities. It is illegal to pour used oil on to the ground, down sewers or drains, or into water sources. The regulations concerning pollution vary between regions. Use an approved refrigerant recovery unit any time the air conditioning system must be discharged. Refer to HA-21, "Description".